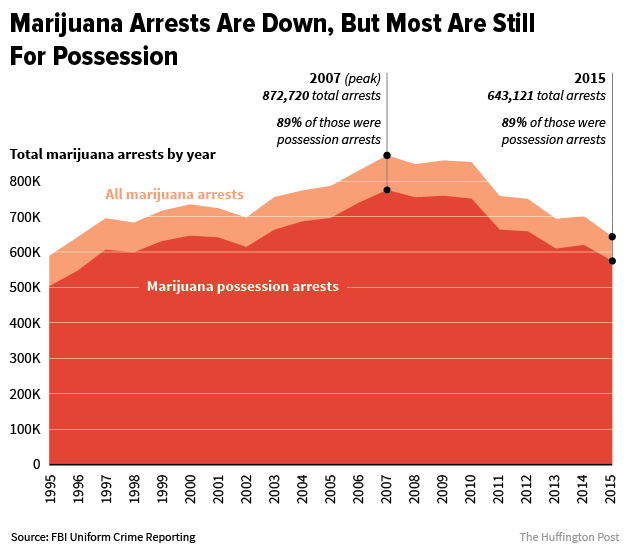 Cannabis arrests are at a 20-year low. Although a step in the right direction, the FBI’s report still shines a light on some huge problems. The FBI released their crime analysis data on Monday for the year of 2015, and the findings include bittersweet details regarding marijuana-related arrests. Police across the country had made the fewest amount of cannabis arrests in the year 2015 since 1996. And charges of the sale and distribution of the plant are the lowest in the last 25 years. While the sheer number of arrests are still mind-boggling, the country seems to be heading in the right direction. American authorities still made 643,000 arrests that were cannabis related in 2015 alone. In other words for any given day, someone in the US will be arrested every 49 seconds for either possessing or growing a plant with medicinal properties. If you thought that was bad, just think that for all the illegal drugs out there, cannabis arrests account for 43.2% of all drug-related seizures. So for every drug-related police query, cannabis will be the culprit almost half of the time. Talk about a waste of time and tax dollars. Things aren’t all bad when it comes to the crackdown on cannabis. Back in 2007, almost 900,000 people were arrested with 775,000 for simply possessing pot. So the closer these numbers get to zero, the better right? Wrong. In 2016, the number of cannabis arrests should actually be a negative value. The hundreds of thousands of prisoners that are locked up in facilities for non-violent cannabis charges should be released without a doubt. Tom Angel, the chairman of Marijuana Majority is striving to spread the truth about how the public and law enforcement’s feelings on cannabis are totally different. Do you find the FBI’s data to still be someone depressing? What else can be done to get the DEA out of BigPharma’s pockets and legalize cannabis? Share with us on Facebook, Twitter, or in the comments below!